The recent death of a white rhinoceros at the San Diego Zoo got me thinking about my own memorable experience with these magnificent animals. I was stationed in Korea from 1997 to 2000. Had I stayed one more year I doubt I would have ever returned to the US. There were a number of reasons for wanting to stay in South Korea, the people, the exciting culture, geography, etc. But elephants and rhinoceroses were my reasons. Elephants mainly, something I’ve written about before. But rhinoceroses made up a powerful part of the other. Next to the elephant pen at the Seoul Zoo a large enclosure contained four rhinoceroses – two adult females, one male calf, and one adult male. The calf was born in the zoo. (Since then, incidentally the Seoul Zoo has had two other successful rhino births, a fact not well known outside of Asia.) The animals were White Rhinos. As you may or may not know, the white rhino’s appellation has nothing to do with its color. They are gray; very similar in color to African elephants, and like the African elephant the color of the white rhinoceros is normally the color of the dirt or mud it happens to be in. These guys enjoy their mud baths! The name reportedly come from an English corruption of the Dutch word for “wide,” a reference to the wide, square shaped mouth of the animal, but no one really knows for sure. None of this means a thing to the rhinoceros, of course. A formidably armed two and a half ton beast does not spend a great deal of time worrying about human linguistic problems. 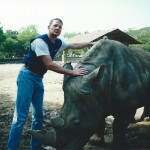 I on the other hand had spent a great deal of time pondering rhinoceroses, especially since arriving at the Seoul Zoo. Many years earlier I’d seen a television show that featured a circus with a trained, or at least reasonably tame, rhinoceros. The show featured the man standing in a center ring. Standing placidly by him was this wonderfully powerful looking animal, easily capable of demolishing anything and anyone in its immediate environment, but doing nothing save standing there like an overgrown dog. 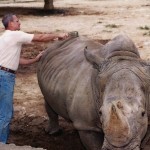 I specifically remember the man saying something to the effect that rhinos love to have their back scratched. I was fascinated. The idea had gnawed at me ever since. After working with the zoo’s elephants for a year and gaining the trust of the staff I decided the time had come to see if I too had what it takes to train, or at least tame, a rhinoceros. It was winter by then and the rhinos spent most of their time inside cold weather quarters, an iron barred, concrete floored enclosure within view of the public but separated by a wide space. With the exception of the iron bars, however, not much at all separated the keepers from the animals. Reaching over and touching a rhinoceros was no challenge – provided, of course, that you had no concern about losing an arm or being gored. But the important point was that the animals were accessible. I began my experiment with the calf. The calf and its mother were kept separately from the other rhinos and this provided the opportunity needed. The other rhinos would not allow me to approach anywhere near them. As soon as I got too close the big mammals would huff and snort and gallop away with such alarm that I was afraid they’d hurt themselves in the confined space, not to mention me. The calf was different. The “little” fellow was genuinely curious about me and the oversized scrub brush I carried. I started with his muzzle, just barely touching him along that big broad mouth for which he was named. Bit by bit I spread my bristly massages to his jaw, then the neck, then the back of the neck, and finally to his back. The calf was in ecstasy. His mother’s reaction was extremely interesting. At my first approaches to her calf she inevitably became very agitated and often physically pushed her son away from me, snorted her disapproval, and several times demonstrated that she knew how to use that horn of hers – and who she’d like to use it on. But as calf and mother became more and more accustomed to my presence she began to tolerate my closeness to her offspring. Soon tolerance turned to curiosity. By spring mama was enjoying her back scratch as well. With the warmer weather the animals were turned outside. Now mother and calf were joined by the other females and the male rhino. The outdoor enclosure design allowed access to the animals, but only from the other side of a concrete barrier. I continued my weekly scratching ritual with mother and calf. As expected the other three rhinoceroses reacted with great agitation at what must have been to them a positively bizarre spectacle. But then a remarkable thing happened. Just as the mother’s curiosity overcame her fear, so did the curiosity of the rest of the herd. Soon I was scratching and petting all four and my wife and the Korean keepers joined in the fun. I was not, however, satisfied. I had to take the next step and see if I could stand side by side with a rhinoceros. No iron bars, no concrete wall. Just me and the animal side by side. One day I took the big step. 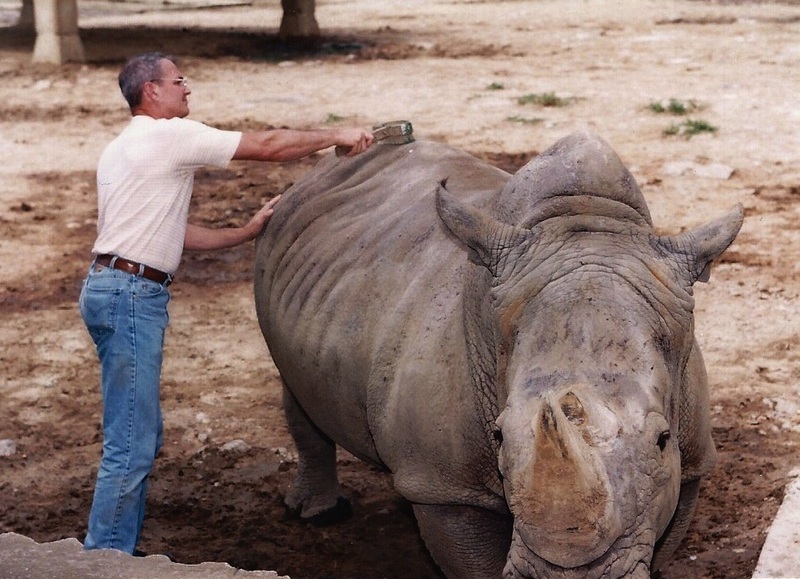 I had up to this point been leaning over the narrow concrete barrier to brush the rhinos. It was a safe and practical arrangement, but idea of standing right next to one of these great beasts was overwhelming. With great care, and not a little trepidation, I stepped into the enclosure armed with nothing more than my scrub brush. I was not trampled, stepped on, or gored. As if they knew exactly what was expected of them the rhinoceroses lined up like well behaved dogs waiting for their master to pet them. And that’s just what I did. Soon were we all in the rhino enclosure every week putting on a show for hundreds of incredulous spectators. It remains one of the finest experiences of my life. Rhino skin feels much like canvas along their massive backs and sides. Behind and around the ears, however, the skin is surprisingly soft, almost delicate. As you might imagine that stubby, powerful physique is superbly designed for short bursts of speed and knocking things down, but woefully inept at back scratching. These animals simply adore having any part of their great bodies vigorously scratched. Many zoo keepers around the world, in fact, use this principle to get these fairly nervous animals to perform behaviors vital to their health in captivity. Not many of them actually stand in a group of rhinos unprotected. But I did. I can’t boast of too many accomplishments in my life, but about this I will. That’s probably why I was so impressed with Saba Douglas-Hamilton. She not only stood unprotected in a heard with a herd of rhinos, she did it alone, at night, and with Black Rhinos, an animal with a worse reputation than the White. She didn’t scratch their backs, though. I’ve not been able to touch those wonderful animals or feel the overwhelming pleasure of their presence since those days in Korea. I’m sad for that. I don’t think I shall ever have the chance again. But I thank God for one time in my life to have trained, or at least tamed, a rhinoceros. Thanks, much. No newsletter yet due to time constraints but I’ll consider it.